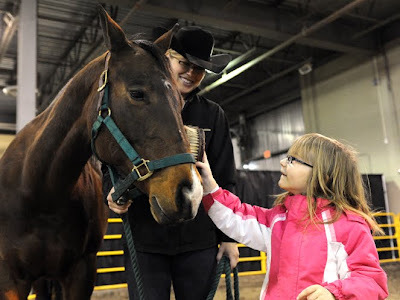 The Can-Am Equine Extravaganza proved to be a lot of fun last weekend. We brought horses for the Ontario Quarter Horse Association and for the reining demonstrations with Gary Yahdijan. 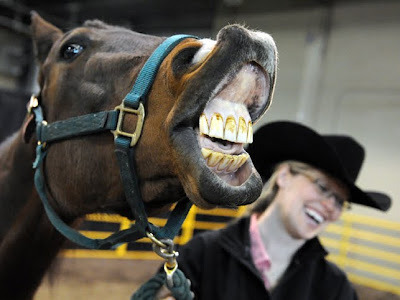 "Horse Power", was a special event that pitted one breed against another for a barrel-racing and pole-bending challenge. Here you can see Genzanit, fondly referred to as "Dunnit" or "Donut", representing the Quarter Horse breed, about to run against a Curly Horse. There was also an Appaloosa, Gypsy Vanner, Spotted Draft, Percheron, Miniature Horse, Freisan and a Thoroughbred. Gary did a great job explaining job of the reining horse to the crowd. There was a beginner rider or a mid-level trained horse, a skilled non-pro rider on a well-trained horse and Jessie and I as the Open riders on another couple of great horses. Jessie did the demonstrations for the Quarter Horse breed with this colt, "Whiz", a grandson of Topsail Whiz. Thanks for having us Can-Am! Hope to see everyone again next year! It has been a busy couple of months for us, hence the lack in posts. We're hoping to make up for it with some great shots of what we've been busy with! J-lo was a superstar at the Western Fair District Sport and Rec Show in February. She was part of several grooming, saddling and riding demonstrations where some lucky participants were chosen from the crowd to participate. The picture above was selected for the front page of the London Community News and the picture below includes our new friend Brooklyn who was chosen from the crowd to try grooming for the first time.